Anat Ebgi is pleased to present Jibade-Khalil Huffman at Art Basel Miami Beach in the Positions Sector, Booth #P03. The booth will feature an entirely new body of work that focuses on themes of the black male ego in American pop culture, film, and literature. The installation blends video with mixed media lightboxes, creating a dynamic visual affect. Flat screen monitors are embedded under layered transparencies mounted on shaped plexiglass. The semi-concealed monitors feature two new connected video pieces, Untitled (LeVar Burton) and Mirror, as well as the main video, Figuration B, that incorporates archival and pop cultural sources layered with a soundtrack constructed of found and made sources to make something akin to a video mixtape. Two other lightboxes in the presentation replace the moving image with a static layering of text and imagery. The phrase, White People Explain John Baldessari to Me, references Rebecca Solnit’s chronicle of man-splaining “Men Explain Things To Me”. The text is embedded within a black and white image of balloons and vintage ladies shoes— whimsical images that would perhaps be something Baldessari himself would use when suggesting soundtracks for photographs with his students. 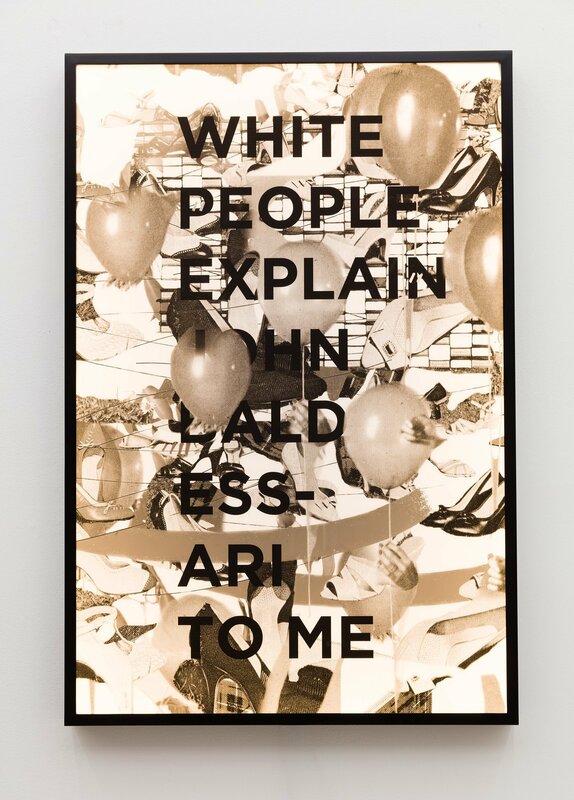 The work also speaks to a tendency within an artworld still sorely lacking diversity to attribute any and all gestures to a white/Eurocentric model of beauty and knowledge. The piece is contrasted by Black People Explain “The Facts of Life” to Me. Utilizing three layers of plexi transparencies and fluorescent bulbs, the image of “Tootie” looks directly at the viewer sandwiched between bulbs and found images of white children. The works explore the importance of words, didactics, and pop cultural icons in the creation of an artistic and cultural identity. Jibade-Khalil Huffman (b. 1981, Detroit) received his MFA from the Roski School of Fine Art at USC in 2013, an MFA in Literary Arts from Brown University in 2005 and BFA from Bard College in 2003. 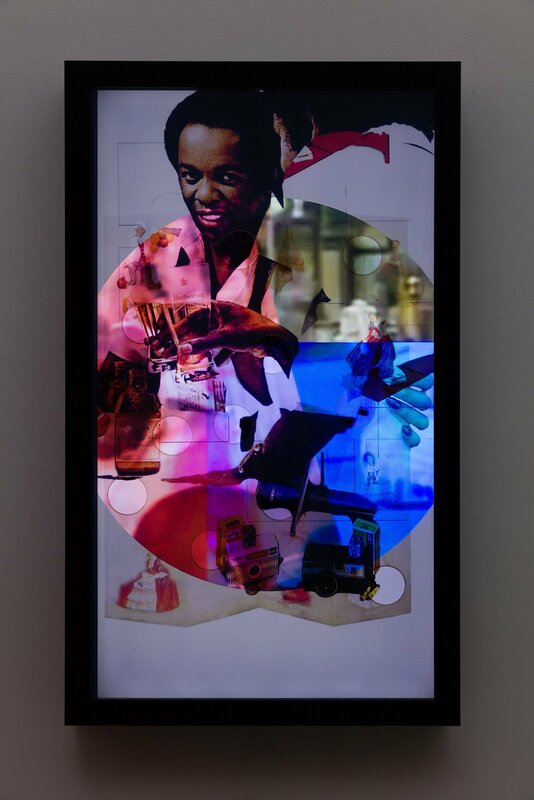 Huffman’s practice involves poetry, photography, video and installations, often using collage and the archive in relation to nostalgia and memory. Huffman was an artist-in-residence at The Studio Museum in Harlem in 2015-16 and was included in the 2014 Made in L.A. Biennial at the Hammer Museum. He has presented work internationally at institutions including the ICA, Philadelphia; MoMA/PS1, New York; MOCA, Los Angeles; Swiss Institute, New York and the Portland Institute for Contemporary Art, Portland. Huffman has exhibited work in solo and group shows at galleries including Anat Ebgi, Los Angeles; Blum & Poe, Los Angeles; LACE, Los Angeles; LAXART, Los Angeles, and Marianne Boesky East, New York. “5 new things to see and do at Art Basel 2017,” South Florida Business Journal, December 6, 2017. Carrigan, Margaret and Casey Lesser, “18 New Dealers to Watch at Art Basel in Miami Beach,” Artsy, December 3, 2017. Gerlis, Melanie, “Art on its sleeve,” The Financial Times, December 1, 2017. Shaw, Anny, “Race relations in the spotlight at Art Basel in Miami Beach,” The Art Newspaper, December 1, 2017. “Positions Sector at Art Basel Miami Beach,” Blouin Artinfo, November 28, 2017.